A big gender divide exists between men and women in their 40s in belief in God and life after death, a poll suggests. Of the British men surveyed, 54% said they were atheists or agnostics compared with only 34% of women. The study also showed that Muslims in the survey had the fewest doubts about the existence of God and the afterlife. The research involving more than 9,000 British people born in 1970 was analysed at the University of Essex. The figures showed a substantial proportion of those who had said religion was an important part of their lives at the age of 16 became relatively unreligious as adults. Sixty per cent of the women in the study believed in life after death but only 35% of the men. 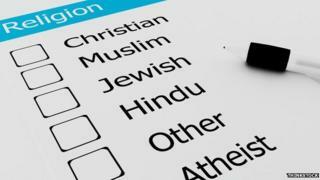 Almost half said they did not identify with any religion while most of the others had a Christian background. Prof Voas said men were twice as likely as women to say that God does not exist. Of those who were religious, 71% of those who described themselves as evangelical Christians had no doubts about God's existence. However, only 33% of those who said they were Roman Catholics had no doubts. Among Anglicans and Methodists, the equivalent figure was 16%. The study also showed that belief or disbelief in God and the afterlife did not always go together. However, nearly a third of those people who labelled themselves as "religious believers who have occasional doubts" did not believe in an afterlife. Professor Voas also highlighted the very high level of belief in both God and life after death among Muslims. Some 88% of Muslims in the survey said they knew God really existed and had no doubts. Should Britain become a secular state?